Featuring hard wood legs ending in little painted black hoofs, the Nia Baa Stool makes the perfect ‘sheepy’ footstool to put your feet up on! * Fully upholstered cushioned seat featuring sheep ribbon trimming. * Free Brush to keep your member of the flock looking tip top! * Comes flat packed in a Baa Stool carry box – Some self assembly will be required. 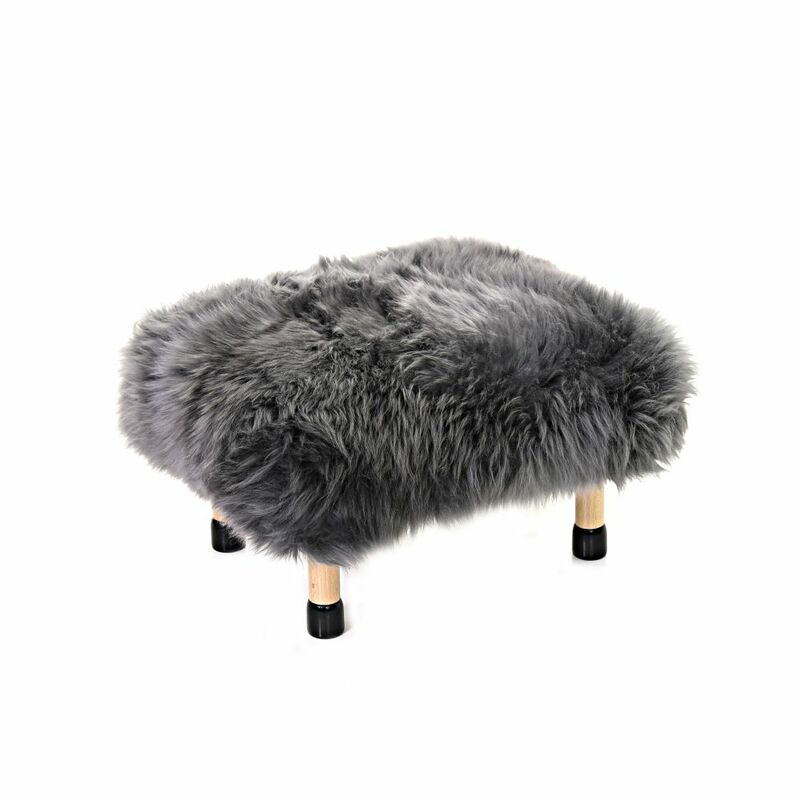 * Measures approximately 50 cm x 40 cm x 27 cm high including the sheepskin- as sheepskin is a natural product each of our lovely sheepskin Baa Stools are unique and can differ in texture and length. * A little tip – For extra luxury take the removable cover off and pop a hot water bottle underneath…ta-DA- your very own heated footstool! * Sheepskin is a natural product so please keep the dyed colours out of strong sunlight as it will bleach and dry out the skin. Baa Stool is here to make people smile when they walk into a room. We do this by creating stylishly quirky furniture using real British sheepskin. The aim with the Baa Stool was to make a practical, functional piece of furniture that could fit in anywhere but still have a real wow factor. The result is a range of quality, unique and contemporary sheepskin furniture that compliment modern and period interiors equally. At Baa Stool we hand make luxurious sheepskin furniture and home accessories on site in our workshop in North Wales. We have a whole flock of products, from sheepskin footstools to 'Flockstop' Doorstops which are all available in a wide selection of sheepskin colourways .